When true island style living is your objective, we support you like none other. Each tiki hut kit is built to order using the highest quality construction industry standards for year round vacation living! Our kits are custom made and are built to order. Estimated time for us to ship from date of order is about 3-4 weeks. Bamboo first made its first appearances in the fashion industry, but due to new technology, has been discovered to produce clothing, flooring, furniture, and even medicine. Bamboo has been originally known for its contributions to the Chinese culture but has since been introduced to North America and surrounding regions. It’s a plant that possesses every quality you’d like to see in material for your DIY projects: durability, lightweight, easy to maintain, breathable, environmentally friendly, and 100% all natural. Palapa Kits - Palapa kits are made of dry palm leaves that have been carefully woven to create thatches. These thatches can then be used in the production of many outdoor structures and landscaping designs. Palapa kits provide a variety of easy DIY projects including umbrellas, huts, wall covers, and more. They generally take 2-6 hours to self-install depending on the project type and size of your finished product. 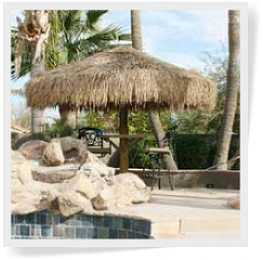 Palapa thatches can withstand excessive heat, water, and old age making it the perfect solution to create your backyard Zen designs. 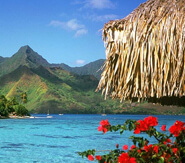 Tiki Huts - When you think of tiki huts, pictures of the clear, blue waters of Hawaii may run through your mind. But, tiki huts can be utilized for enjoyment in residential properties as well. Many of them are strategically hand woven to last your family a number of years. With tiki kits, you can build your own tiki huts and bars in less than a day. They’ll look as if they’ve been a custom installed project that took months to finish. Tiki huts and Palapa kits can be purchased quick and easy. With Sunset Bamboo, you can enjoy nationwide shipping that’s not only free but fast as well. Don’t forget to ask about our policies on purchasing wholesale amounts. You will typically receive a discount when you surpass the minimum whole quantity. Zoos, restaurants, tourism destinations, resorts, and theme parks in every culture are all utilizing tiki hut and Palapa kits to create a serene atmosphere that will keep their guests returning again and again. There’s also commercial grade options available to the general public so you can own the exact same products these establishments benefit from. 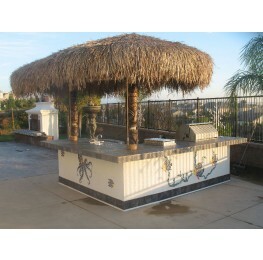 Tiki huts can be used for many different purposes in both residential and commercial areas. Some of these purposes include outdoor theaters, decorations, parties, outdoor kitchens, shade structures, and tiki cabanas. Tiki huts have been around in North America for the last 14,000 years since the first Native Americans settled in the land. 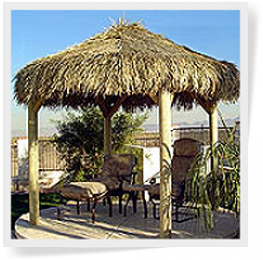 Palapa kits can be utilized in both the lawn area of a backyard and decks / patios. They are the perfect material for umbrellas to sit under on a hot, summer day socializing with friends and family members. 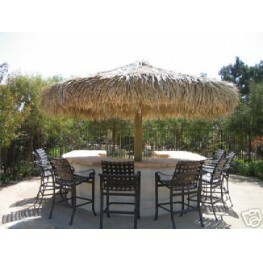 Palapa kits are also purposed as table covers, fencing, barbeque covers, and patio furniture. You can even let your DIY juices flow and put these kits to use in products never thought of before. You may already know that trees are responsible for producing oxygen and improving the overall air quality of the earth. As years go by, the destruction of different plants and trees are causing air pollution, erosion, temperature increases, and the upsurge of plant diseases. The Amazon rainforest, coined as “the lungs of the world” is gradually reducing in size as the need for its plant wildlife is increasing to build homes and make paper, as well as other products. Bamboo is a great plant to eliminate the harmful effects of deforestation by creating a replacement option for trees. • Bamboo controls soil erosion: Bamboo has a complex root system that allows it to properly maintain soil erosion by acting as a barrier. Its roots are also beneficial to the health of the soil. • Bamboo forests reproduce quickly: In a traditional forest setting, trees would take over a decade to reproduce after they’ve been cut. Bamboo only takes a maximum of 5 years to grow back and continue helping the environment like they once did. 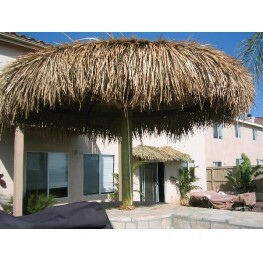 Palm Thatch - Palm thatches are one of the oldest, most traditional types of thatches. The underside of the palm thatch is always 10 degrees cooler than the weather, providing an optimal amount of shade and relaxation. Bali Thatch - Bali thatches are the smoothest of all thatches and are recommended for regions with mild winds. 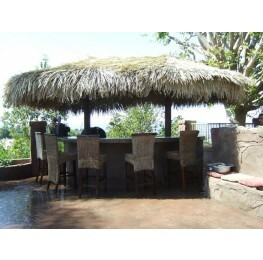 Synthetic Thatch Panels - Synthetic panels are made to appear natural and can last up to 20 years. They are UV resistant, fire retardant, and lightweight enough for roofs. Are you looking for a his and her backyard retreat? 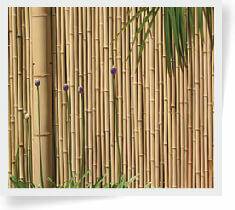 Or a simple bamboo structure to add to your small backyard? The 9 and 12 ft. single pole umbrella products are designed to be locked into your patios, bars, or barbeque islands, or placed directly into the ground. Single pole umbrella kits generally include step by step instructions, main support poles, framing that’s been partially assembled, roof thatches, and hardware. If you have a large space you’re planning to design, 12 and 14 ft. four pole huts are your best option. To put these measurements into perspective, the length of the average elephant from the shoulder to the toe ranges from 8.2 to 13 ft. tall. Even with their large size, these huts are lightweight, easy to assemble, and portable. 12 and 14 ft. four pole huts present shade and protection for larger table sizes, allowing you to host parties and other gatherings at your own home with a hefty amount of guests. The benefits of this size of pole can range, depending on the thatch material that’s been used. Please note the lodge poles will have color variations due to the fact that it is a natural product. Pinewood poles are know to split at times.